why have so many books been written? why are there so many controversies? why has it only recently become available to ordinary riders? why do some people dismiss it totally out of hand? The answer to this question is more complex, but basically classical dressage has always been available throughout the world but has required some searching out. The main stumbling block has been an elitist image, due probably to a world shortage of national institutions where it is demonstrated and taught. 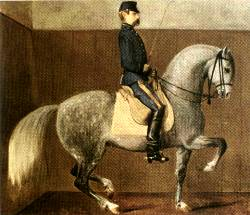 Where once the courts or the military, for the purpose of cavalry, maintained the status quo, nowadays only the truly dedicated maintain the high standards, which were once the preserve of all who taught dressage. However, on an individual basis, there are still many who teach classical dressage quite unconsciously. These may vary from quite 'ordinary' instructors in 'ordinary' riding schools, to a handful of our top competition riders as seen - very happily - at the London Olympics. Unfortunately not all teachers and trainers are classical. There are some who are positively barbaric but often this is down to ignorance or simply a lack of feel and sensitivity for the horse. When their methods get copied and adopted as correct ones, then it is time to worry. Pure Classical Dressage - Why is it so hard to find? It is a fact of life that the best things are often a well kept secret. 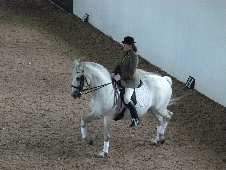 Therefore although there are many pockets of people practising classical dressage all over the world, they may be little known outside their immediate circle of friends and pupils. It was for this very reason that back in 1995, I started The Classical Riding Club. As well as spreading the word about the classical ethos, I felt there was a great need for an International Register of Teachers and Trainers. This required them to sign up to our Charter promising to protect the horse and discredit quick-fix, rushed or crude methods of training. Despite the CRC now being recognised as an Independent Partner of the BHS, there are still many who are unaware of its existence. For riders looking for the right trainer, it is obviously important to assess whether the methods of the professional concerned are in fact based on classical lines. Without inbuilt knowledge oneself, it's almost impossible, initially, to assess knowledge in another. With so many experts competing for position, it becomes a minefield knowing whom to go to and whom to trust. For a glimpse of the real thing, one can do no better than watch a performance by one of the great academies of Classical Dressage. 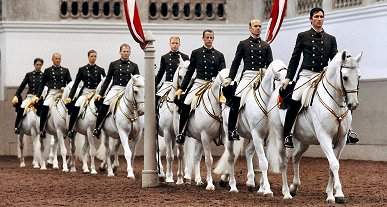 The Spanish Riding School of Vienna, the Portuguese School of Equestrian Art, the Royal Andalusian School of Equestrian Art and Saumur in France were all founded on strict principles laid down over many generations to protect the horse throughout his training. There was to be no stress, no forcing of the horse onto the bit and the horse had to move as proudly and harmoniously as he would in Nature. Unfortunately, we do not see this in every dressage arena or riding school today - but it's important to know it is out there! 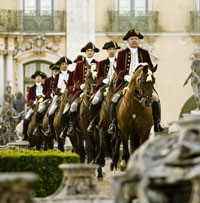 If you want to see Classical Dressage for real, you do not necessarily have to go abroad, but a trip to Vienna, Andalucia or Lisbon is hugely worthwhile and will certainly inspire and heighten perception. Word of mouth is often the best way to discover lesser known places where classical dressage can be seen in action and provided one sticks to the criteria of happy, balanced, beautiful, unstressed horses moving in total harmony with their rider where the aids look effortless and invisible, you may be fortunate enough to see classical dressage in the flesh. Once you have seen the real thing you will begin to see the difference when it isn't right. After all, you don't have to be an expert in opera to recognise good singing, neither do you have to be a ballet dancer yourself to appreciate pure art. The eye in general doesn't lie, but you do have to look in the right direction!